Everyone!! Especially for the few already here! Rather cloudy & overcast today. Guess I'll have to make my own sunshine! Guess it's that time of year. Hubby is bringing in the wind chimes for the winter season. Terrific, Shosho! I was going to grab your number for you and you beat me to it! The new gas line is in. It was quite a large undertaking. I had the little kids here yesterday. They were quite excited to see all the goings on. I'll try and post some photos so you can see what we were dealing with. Hubby has been out all morning doing driveway clean up. Pictures are up. I have to say I was pretty impressed with everything that was accomplished in one day. We were told they would send a restoration crew next week to re-seed with ''fast growing seed''. We'll see how that goes. It's pretty late in the year to start grass growing. Fingers crossed! We had to wait all winter for restoration after they buried lines to a new subdivision behind us. They left huge furrows. Hubby got tired of waiting and dug and smoothed out the whole ditch himself. Since our side and back yard is on a large curve it involved digging a 1 1/2 acre length of ditch. And - we replanted the grass ourselves. I'm suspecting this will be the same for us, Shiela. Hubby is not known for his patience. 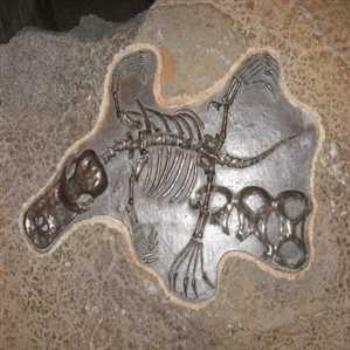 That Platypus skeleton looks ok to me, but what are those ring thingy things? 1:37. A belated Good Morning! Lanky Yank for the interesting photo! First time I've seen a Platypus skeleton. Morning all, Rage, if I had known you were awake I would have come to the site earlier. I've been up since 3:30. yikes!! is that a six pack top in bronze with it! that, caught around it's leg. We really do need to clean up our act. There are three copies of the poozle (don't do them all) and the short introduction I did has disappeared. It always surprises me how crooked column E is when the original was almost completely in line. Still it doesn't seem to cause any problems to you, the ones who matter. Hi to all of you dears friends wherever you are and enjoy your time.. I see just one, Wombat. I'm buggered!!! Just finished my lawns and it's quite a warm day. I think there was more weeds than lawn.